Gold can be found in a number of different areas within Rhode Island. Hobby prospectors may be able to recover enough gold to satisfy their interest, but commercial mining within the state has never been profitable. Even with the record high gold prices that we have seen in recent years, there are no commercial gold mining operations in the state. Historically, there were a handful of attempts to mine for gold in Rhode Island. The Durfee Gold Mine in Providence County supposedly produced some gold in association with pyrite. When most people think of pyrite they think of “Fool’s Gold”, but it is true that real gold is often associated with pyrite deposits. A stamp mill operated the site, but no records are available of overall gold production from the mine. Another site in Providence County is near Diamond Hill. It is believed that some gold was found in the vicinity. The area around Johnston was also mined for gold on a small scale. The recovered quantities of gold from these areas are unknown. Another series of prospects are located east of the town of Foster, where it is believed that gold was mined for a short time, most likely in association with other minerals. Several open pits are located on the site, but they are now flooded. Production of these mines is believed to be limited, but it is possible that more gold can be found in the area. 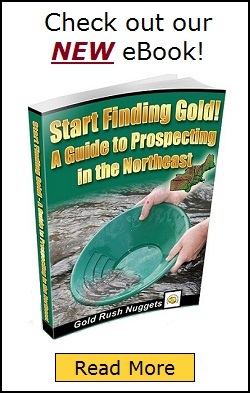 The potential for finding any significant amounts of gold in Rhode Island is relatively low. Most of the historic mining that took place early in the 1800’s petered out rather quickly after it began, indicating that any discoveries were not commercially viable. Even with gold prices at record highs in recent years, operating any type of sizable mining operation takes considerable money, and there are many other states that have a much higher potential for producing a profitable mine. Even on the east coast, there are mining opportunities in Georgia and North Carolina, as well as many other states that are known to produce much better quantities of gold.